I have typed and deleted and typed and deleted at least a dozen sentences here this morning. Not one of them said what I want to say. To use the word “overwhelmed” seems trite and insignificant. The word “unsettled” comes close, but doesn’t quite hit it on the head. “Angry” works too, but it’s still too general. It seems every time I turn on the tv or radio, open my Facebook or Twitter…something is wrong somewhere close to me. Someone is hurting. People are dying. The cowards are gaining ground; no longer sitting in the shadows. I feel as though the world is broken somehow, and we are so tiny in it…trying to stand up against forces of darkness we can’t even begin to overcome. How do we win? And the bigger, and maybe even more important question is, how do we teach our children to be brave enough to win? How much of the turmoil that surrounds them do we share with them? How much do they need to know to be equipped to keep themselves prepared, capable of standing strong? We are grown-ups. We see the darkness and try desperately to shield our children from it and keep them safe. Everyday. My smallest children do not know of the unspeakable tragedy at Sandy Hook. They do not know of the monsters who caused mayhem and destruction at the Boston Marathon this week. I want them to feel safe. I want them to play and joke and be free. I want them to know their mama will be there to make them dinner and pack their lunches. I want them to dream of what it is to be a writer, an astronaut, a fireman, or a race car driver. I want them to sleep at night. But how do I teach them courage? How do I teach them to see it through, even when they know they’re licked? When they are standing in front of insurmountable opposition, how will they find the strength to just keep doing what they know is right? And how do I keep their little spirits safe? Oh boy. These are big questions. And what I dislike the most about them is that they even have to be asked. I was led by Art in Hand to a message on momastery.com this morning that helped me answer some of these big awful questions. My kids can and will do hard things. I’ve seen it. I will continue to see it. They will need courage. The real, struggling-through-the-tears-to-do-the-right-thing- and-never-give-up kind of courage. And though I may not always be able to keep them safe, I can teach them what it is to be kind, honest, careful, and brave. To be their best selves. And to not be afraid. Arlee, the problem is with the media. In order to gain attention = gain money from advertisers they have to show something shocking and as they do so, they have to raise the level of shocking all the time as people get used to it and adapt. 100 years ago there were about the same numbers of bad news, incidents, much more wars and deaths and all, but you did not know about all the bad news from all over the world, just the local bad news. Even that was quite enough… Furthermore, media in the U.S. are raising fear on purpose. Try some different source of news and you will see for yourself. I have to say (living right outside of Boston) the whole incident has been very scary, but I also know I do not want my daughter to know anything about it or that we are scared. She is four and right now her life should be safe and happy. We have been doing our best not to let her hear anything about it. Her father had to work from home today since his office was in the lockdown area, but we made it seem normal since there have been other days where he unexpectedly worked from home. Now fortunately, we do not know of anyone we know personally injured or killed by the bombing, so we have not had to attempt to explain that. How much you tell a child depends on the child’s age and comprehension. I know our daughter’s teacher sent out an e-mail asking all the parents to try to shelter the children from the news as much as we can. We received a similar one when Newtown happened. (I grew up in Connecticut and have many friends who teach there and live there still so that one was too close for comfort as well.) I remember going to church Christmas Eve and seeing our minister trying to get out luminaries for the Newtown victims. We offered to help and when he tried to explain what they were for, I looked at him and whispered she doesn’t know about it, but as a family we put out the luminaries and let her just think we were giving a helping hand to make it special for Christmas Eve. Sorry I guess I’m getting off topic here, but in such a scary time I think it is important to figure out what you can protect your child from and what they can deal with depending on their age and maturity. Hope that helps. tragédias ainda aconteçam em nosso Orbe, é porque ainda tem pessoas que compartilham e vivem nesse conflito, e para essas pessoas, o conflito se torna necessário para o crescimento pessoal e espiritual…. Mas, não podemos nos esquecer que ontem…, em alguma de nossa encarnação, fomos nós que causamos atritos. Acredito que temos que orar à Deus por um mundo melhor, para nós e para todos que vivem nesse Orbe. Arlee, Hi! Thank you for writing and sharing this! You are expressing a lot of what I have heard over the past few days. All of the bad news is emotionally draining. How do we teach courage? I believe that teaching courage begins with modeling the behavior. 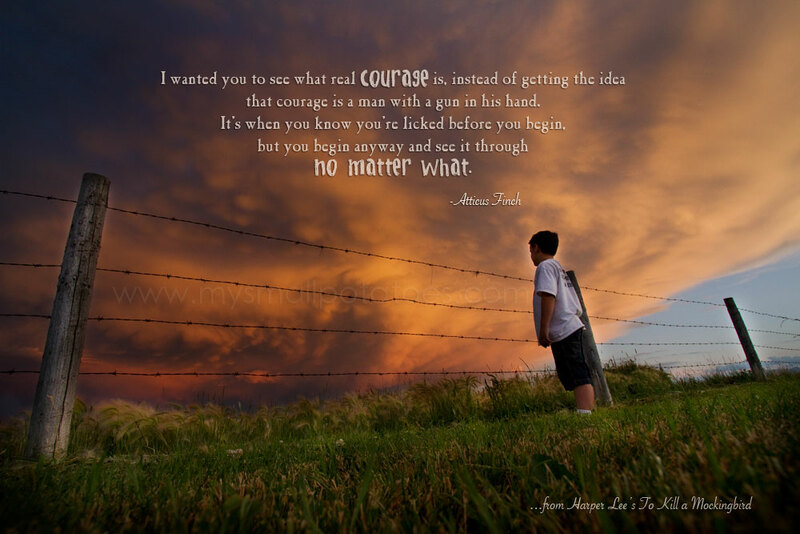 I have had to do a lot of things over the past year that have required great amounts of courage on my part. If you can face down the enemy without showing fear, that is courage. Getting up out of bed everyday and going on with life in the face of oppression, no matter how big or small, is courage. Being human and sharing your stories, good and bad, and showing who you really are is courage. I think teaching them problem solving, critical thimking skills, and rewarding the effort they make to engage in the process mean that when they find something they are passionate about they will feel that they can make a difference and indeed it would be quite wrong for them to sit this one out. I think of who helped me feel that way about I the world and it was my grandparents. They did these things and they modeled it. First time reading! Definitely will be reading more! This post resonated with me because I was having similar feelings. And I came to realize that my reaction to specific news is due to two different, but related reasons. I feel scared, very scared, for my child and all the children of this world, and I feel scared because what humanity do we have left if we are able to hurt so badly the innocent ones among us? It’s like a sort of foundation gets crumbled under your feet. Of course there are wars in so many places, and innocent little lives are taken away every single day. But then there are Sandy Hook tragedies, acts of random terrorism like the one in Boston, 4- and 5-year olds raped and brutalized in Delhi: atrocious things happening in the midst of ordinary lives, in ordinary places, among ordinary people. That’s what scares (and angers, and saddens) me the most. It breaks my heart to read this post! I know what you mean! Here in Australia strange and cruel things happen and as a Christian I know God is in control but when you see the brutal tragedy in India I often say to God why? I know it is a fallen world but children? As much as I love To Kill a Mockingbird, I always go to Mr. Rogers for help processing tragedy. And I’ll encourage my daughter to do the same.